The battle was won at Dolan’s Warehouse on Friday, June 25, for the honour of opening the Bob Dylan Concert at Thomond Park on Sunday next, July 4. The resounding victors from a star-studded line-up of bands was the band fronted by Pa O’Brien which ‘lifted the roof’ on the night. Pa is son of Marie O’Brien and Gerry of Ballymartin and the musical traditions of the O’Dea family of Carheeny comes out in Pa’s act. The others making up the band are Dave, Rob and Gerry, all musicians with a strong personal ethos that is blended into the one dynamic group who’s C.V. will shortly feature ‘Opening for Bob’ at the Thomond Park. Even if you don’t know what ‘Grunge Rock’ is, it is worth looking out for the music of this group, which is described as ‘alluringly aggressive and addictive’. It’s all available on their EP under their name ‘The Last Days of Death Country’. And remember you first read about them in the ‘Kildimo Notes’! 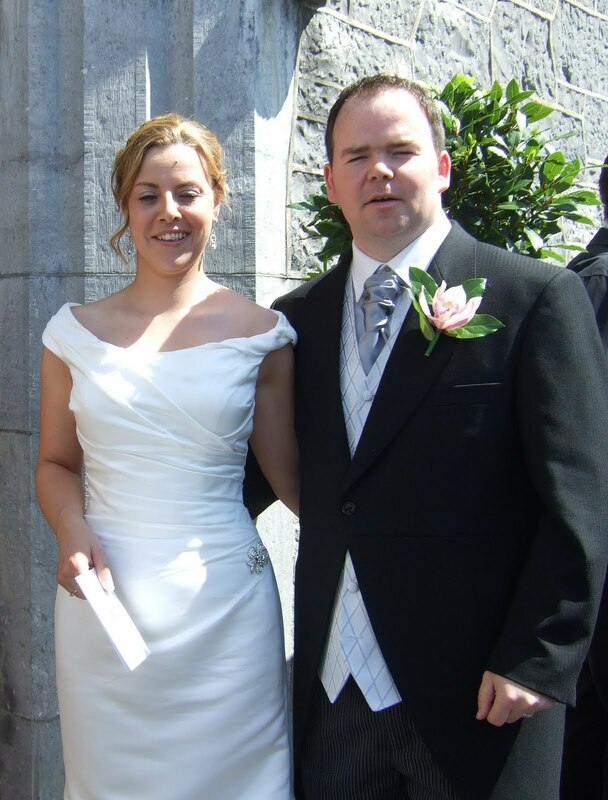 Sympathy is extended to Kitty & Benny Farrelly of Ballynacarriga on the recent death of Kitty’s brother Michael Ryan and to Michael’s other family and friends. Formerly of Montpelier, O’Brien’s Bridge, his funeral took place from Meehan’s Funeral Home, Castleconnell, on Friday June 25 to the parish church Castleconnell. Following Requiem Mass on Saturday, June 26, his remains were interred in Lisheen Cemetery, O’Brien’s Bridge in the presence of his surviving family, former neighbours and friends. Ar dheis Dé to raibh a anam. (Sunday July 4 at 11.00.
and Embury Close, Adare will be celebrated this Friday July 2 in Holy Trinity Church, Adare at 7pm. Solas na nGrást dóibh uilig. St. Mary’s Church Pallaskenry was filled to capacity with happy friends and relations of Tina McMahon of Ballynacarriga and Shane (Billy) O Sullivan of Shanagolden to witness their wedding on June 19. Both of their Parish Priests were on hand to preside over the event, namely Fr. John Donworth of Kildimo/Pallaskenry and Canon Anthony O’Keeffe from the groom’s parish. Deborah McMahon, sister of the Bride was Chief Bridesmaid, who was in turn assisted by Orla O’Shea and Karen O’Sullivan. Standing with the groom were Anthony Leahy, John Paul Cribbin and Jason O’Sullivan. Sarah Ellen Murphy and Joseph Spencer supplied the appropriate music and vocals. Kieran McMahon, brother of the Bride proclaimed the First Reading and the Pauline text of the Second Reading was delivered by John O’Sullivan. Prayers of the Faithful were led by Liz Leahy, Luke O’Sullivan Kelly, Shauna Buckley, Josh O’Sullivan, Jack Galvin and Fíona McMahon. Mothers of the Bride and Groom, Brenda and Mary presented the Offertory Gifts to the strains of ‘Ag Chríost an Síol’. Michael (Junior) McMahon, brother of the Bride provided the thoughtful reflection on marriage written by Wilfred A. Peterson, as a Communion Reflection. The very enjoyable reception was held in the Woodlands House Hotel, Adare. Tina is daughter of Michael and Brenda, while Billy is the son of Mary and the late Johnny. The Bride is an Accountant working in Dublin and Billy is in the construction industry. They currently reside to Rush, Co. Dublin, to which they will return after their honeymoon in Mexico and Las Vegas. The newly formed and hardworking Tidy Towns group have been instrumental in providing litter bins in the village and environs. Given the difficulty of educating some people to use them, perhaps the general environmentally aware community might adopt the maxim to ‘Bend and Bin’, thereby benefiting the waistline and the village. Take note also of the present floral displays of wild blooms, which are lovingly cared for by the small core of this committee. Good on you girls! Members are reminded of the forthcoming Centenary Art Exhibition in Dooradoyle Library in early August. ( one painting per person) as soon as possible . with his recently composed winning ballad ‘The Smearla Side’. This Athea native has once again secured first place at Fleadh Ceoil Luimnigh and all good wishes go to him as he makes the journey to Fleadh Cheoil na Mumhan in Kenmare shortly. The next ARA outing takes place on Wednesday July 7. On Tuesday June 22, the Numbers drawn were 6, 17, 21 & 23. Because no punter predicted this combination, Lucky Dips of €20 each were drawn by Marie O’Curry, Ballynacarriga; Shirley Sterritt, Old Kildimo; Margaret McCarthy, Coolbeg; Ger Griffin, Ballynacarriga and Luke & Gerry, Ballynacarriga. Your €2 ticket to win a Jackpot of over €6,30 is available from the P.O., De Bucket, Slattery’s, Seven Sisters and Dromore Inn. Support your local community lotto. The VHI Cúl Camp takes place in Kildimo from Monday July 5 to 9. Applications should be made promptly to the School or to Liam Hayes of Ballyrune at 087 7840685 for application forms. The annual Garden Fete takes place in the grounds on Sunday, July 4 from 1.00 pm. This is always a popular event and a very worthy cause in support of the sterling work of this instution in NCW.